5 Reasons Why You Should Not "Buy Facebook Likes"
To me, buying Facebooks Likes today is equivalent to when website owners bought a thousand (or some kind of a “too good to be true” amount) article submissions, search engine submissions, and bogus text (footer? or sidebar?) links all for a ridiculously low price. Internet Marketing scams like these have been around forever and they always will be. They might not last a while, because Google (and hopefully Facebook) catches on and changes their algorithms to detect scams and quick money/ranking schemes. Luckily Google’s smart new algorithms have devalued purchased links, tons of spammy text, lame question/answer sites, and low value article links. 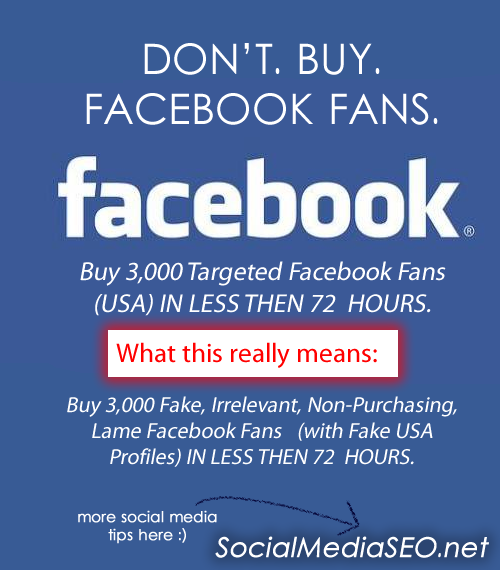 Until Facebook and social media networks find a way to combat the newest scams to gain likes and followers, here’s why you should be weary of buying any sort of a fan or like. Many Facebook page owners who purchase likes have noticed the likes have come from strange profiles names, locations that don’t even match up, and have unrealistic profile information. Some have profiles that say they are previous manager’s at large corporations, then when you look at their birth date it doesn’t even come close to making sense! This is just one example. You’ve probably already noticed this too, but I’ve noticed some friend requests I get have names that just look suspicious. Stay clear away from these type of likes or friend requests because there’s a reason why it looks fishy. Think: no conversions or even virus. There’s always a new scam out there. Right after a new website or technology comes out or Google changes their algorithm, the scammers are ready to create the next loophole to cheat the system or make a quick buck. Facebook, Twitter, and Pinterest are all targets of the most recent internet scams since their high popularity. Common sense but you can see the shift in momentum if you have been working on websites for at least 5 years. What value does having these purchased likes bring to your table? The only thing I can think of is having a high fan value that may attract legit “likes”, but is it worth it? Not to me. I would never want strange likes and non-readers on SocialMediaSEO.net. It would make for a very boring, uninterested fanbase don’t you think? When you look at the overall picture, it’s not worth gaining likes by buying them. It’s all short term recognition that you don’t want. You don’t want temporary results for your company or website. Temporary results may be gratifying at first, but in the grand scheme of things you’re looking for customers whether they are simply reading your content or buying a product. They won’t buy or read if their lame user’s set up from robots or overseas workers. One my favorite examples that shows the Wrong way to gain Facebook likes comes from The Oatmeal called “how to get more likes on Facebook“. So how do I gain a ton of Facebook Likes the right way? Lets face it, you’re going to have to work the hard way to gain your Facebook Likes. Yes, you could gain a million by having an article, video, or product going viral, but don’t count on that. Just create start your own blog beautiful content and your audience will come. Put a simple like button on your website, people will see it. You don’t need a flashing Facebook button that looks like the Las Vegas welcome sign, we all get it by now!